Bottom freezer refrigerators are a popular type of refrigerator that people buy. If you are looking for a new refrigerator, then you will want to know more about the various types of refrigerator models and its pros and cons. Understanding these points can help you make an informed choice. This article will tell you about the pros and cons of bottom freezer refrigerators to help you decide whether this is the model that will suit you or not. It is also essential to know the different kinds of bottom freezer models. The bottom freezer models are available with three door options – dual door refrigerator models, French door with additional drawer models, and single door refrigerator models. There are two freezer compartment choices – swing door models and pull – out drawer models. These models are great space savers as they offer a lot of room to store food and beverages inside them. The bottom freezer makes the best use of the lesser used area of the refrigerator at the bottom. Some of the models even offer features that help you add more room to store items of different sizes easily. These features include adjustable shelving and pull out drawers among the others. The bottom freezer models have compact designs and are available in different sizes to comfortably fit into small kitchens. If you do not have the budget but want something better than the basic top freezer refrigerator, then you can always wait for these models to go on sale as clearance refrigerators. These models are convenient as they do not require you to bend and reach to get the fresh foods out. Since the fresh food section is the section that is more frequently accessed, having this section on top makes it convenient to use. Having the fresh food section at your eye level also helps you find food easily. The bottom freezer models with dual French doors have an additional advantage over the regular refrigerators. These models have an additional drawer in between which can be set to a different temperature than the freezer and fresh food section. This extra drawer can be utilized to keep beverages and food at a higher temperature than the other sections. 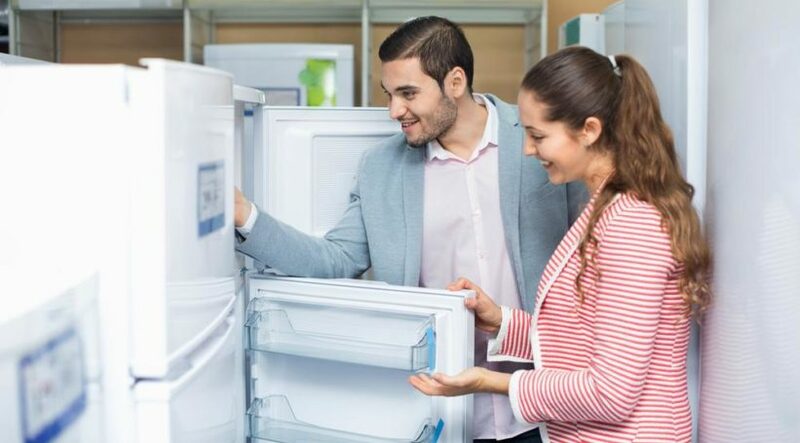 The main drawback that keeps people from buying this model of refrigerators is the cost as the bottom freezer models are always slightly expensive to buy and maintain (most of them are not very energy efficient). The low energy efficiency may result in higher utility bills and thereby increase your expenses monthly as well. But this disadvantage is not a hurdle always as a number of these models go on sale as clearance refrigerators at amazing rates. So, for those who cannot otherwise afford these models, clearance refrigerators are a savior. While the bottom freezer refrigerators, offer convenience in taking out fresh foods, it may be a bit inconvenient to access the freezer section, especially to take out the heavier food items. This model is not ideal for senior citizens as taking out heavy items from the lower section may cause back problems. If you are looking to buy a great bottom freezer refrigerator model without hurting your pocket, then the best time to buy them is when these models become clearance refrigerators. When you buy clearance refrigerators, make sure you measure the spot in your home and the doors to ensure smooth transportation and installation of the refrigerator. Don’t forget to ask about the warranty provided by the manufacturer and choose a brand which gives at least 5-10 years of warranty. Also, ask to know your options of buying an additional warranty.